Last week, the U.S. Supreme Court reiterated Lewis Carroll's pronouncement when it refused to hear an appeal of a lower-court decision that would banish an oyster company from its home on a bucolic estuary an hour north of San Francisco. The highest court was the last hope for Drake Bay Oyster Company (DBOC) to stay in business; after almost a decade of political and legal wrangling, the family-run farm has been evicted from its home of 70 years. The issues at stake are larger than the survival of an oyster farm and the impact of its closure on its employees and customers, and the local economy. The fiercely, often viciously fought debate pitted neighbor against neighbor in the nearby West Marin towns where I've lived for 25 years. Legislators in Washington on both sides of the aisle weighed in. So have advocates of sustainable agriculture; environmental groups, including the Sierra Club, and federal agencies, including the National Park Service (NPS) and Department of Interior. The oyster company is located in the Point Reyes National Seashore, a wilderness area established in 1962 by President John F. Kennedy and managed by the National Park Service. Drakes Estero, home of the oyster farm, was designated a "potential" wilderness area. The Park Service took over management and leased land back to preexistent dairymen, cattle ranchers, and the then-owner of the oyster farm. Since then, the NPS has consistently renewed expiring leases of ranchers. 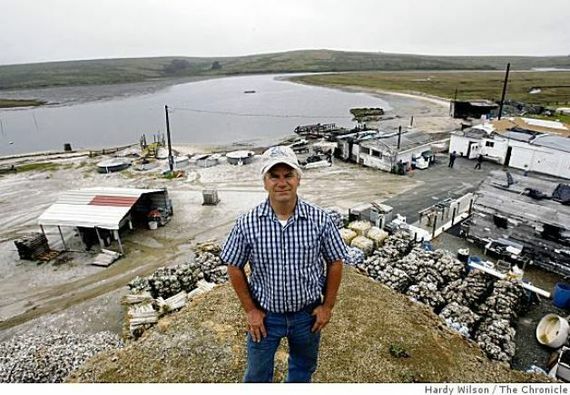 Based on the assumption that the oyster company's leases would also be renewed, a local rancher and businessman, Kevin Lunny, bought the farm in 2005. He invested nearly a million dollars for cleanup and upgrades, but the park service informed him that his lease wouldn't be renewed after all. He'd have to shut down when it expired in 2012. Members of the community and other supporters joined Lunny in a campaign to convince the park service to allow the farm to continue. They argued that the forced expulsion would be anathema to the original vision of the park, one in which wilderness would coexist with limited, sustainable agriculture (in this case, mariculture). They also challenged the very definition of wilderness as incompatible with people or farming in a place where humans have lived for 5000 or more years and coastal Miwok tribes cultivated oysters and other shellfish. Indeed, the original state of wilderness in the greater Bay Area included an abundance of oysters, which were wiped out when Europeans settled here. Lunny sued. Some environmentalists sided with DBOC, while others adamantly opposed it. (I'm friends with environmentalists on both sides of the issue.) The latter group held that if the oyster business were allowed to remain, it would set a dangerous precedent, potentially opening up protected wilderness throughout the country to commercial interests and even offshore oil drilling. They also charged that the farm threatened native harbor seals and eelgrass and otherwise harmed the estuary's fragile ecology. Lunny challenged the veracity of the research that showed environmental damage. Independent analyses of the studies, conducted by the National Academy of Science and Interior Department's Inspector General, determined that the reports were replete with errors and distortions. Corey Goodman, PhD, former Chair of the National Academy of Sciences' Board on Life Sciences, conducted an independent investigation and concluded, "There is no scientific evidence of environmental harm, and I'll put my reputation on the line for it." In an editorial, Senator Dianne Feinstein chastised the NPS, writing, "The Park Service's repeated misrepresentations of the scientific record have damaged its trust with the local community, and stained its reputation for even-handed treatment of competing uses of public resources." Eventually the NPS apologized and removed the faulty studies for its website, but it continued its efforts to evict the farm. DBOC's fate was next placed in the hands of then-Interior Secretary Ken Salazar, who, after conducting his own evaluation, concluded, "There is a level of debate with respect to the scientific analyses of the impacts of DBOC's commercial mariculture operations on the natural environment within Drakes Estero." Nevertheless, he said, the land had been designated potential wilderness by Congress, and that excluded commercial business. The oyster farm had to go. Lawsuits and lobbying continued. The legal case made it to the Ninth Circuit Court of Appeals in San Francisco, which ruled in favor of the government. That's when Lunny appealed to the Supreme Court. Now that the court has refused to consider the case, he is now negotiating the process by which he'll shut down the oyster company for good. If this were simply a case of wilderness versus big business -- an oil company threatening the fragile ecology -- the decision would be a win for the environment. In this case, however, it's an example of myopic thinking by the Part Service and Interior Department. It's also a case of misplaced priorities at a time when millions of acres of public lands throughout the nation, including in our national parks, are being mined, deforested, and threatened by locust-like swarms of tourists. Instead of being banished, Drakes Bay Oyster Company should be held up as a model of how, in some circumstances, sustainable agriculture is compatible with, rather than a threat, to wilderness. Controversies like the one over DBOC must be considered on a case-by-case basis. In this case, the Point Reyes National Seashore is losing a farmer who's been a conscientious steward of our one of our nation's most pristine waterways.